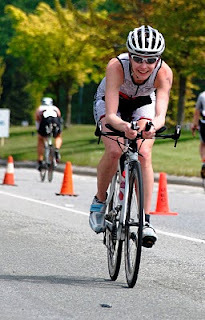 lost in transition: This tri stuff is FUN!! After a week of the weather forecasters calling for rain, it turned out to be a glorious, perfect day for a race. Warm, not too windy and a little overcast to keep the sun off. I even enjoyed the little gusts of wind on the run since they were keeping me cool! My pre-race regimen was a little lacking - realistically this race was intended to be a long training day rather than a key race - but due to the arrival of summer weather on Thursday I was feeling more like enjoying the preceding days and not a lot like taking anything too seriously. Saturday was spent doing a 120k ride with the PSTC group out to Boundary Bay, followed by a long walk (9k) out along the beaches with Bogey, then some patio time at the Galley at Jericho Sailing Club....which meant a burger, fries and ice cream. Good pre-race nutrition, right!? So, quite deservedly, I had an awful sleep last night and woke up with a headache! Luckily, my heat time was 12:05 and left me plenty of time to leisurely collect my things and head to the transition area around 10:30am. This would be my first "pool" tri and only my third tri ever, so I wanted to go suss everything out in advance. Unlike the chaotic open water swims I had experienced before, the pool swim was quite civilized, with swimmers self-seeding and being released in 10 second intervals. Up and down the pool for 800m, get out of the pool and repeat another 700m, then a long run out of the pool and into T2. My swim went fairly well, seeing as I am a swim newbie and still rather uncomfortable in the water. I even managed to pass 5 people and was only passed once. Swim still needs work, but much better than before. Didn't wear a watch in the water to remove the pressure, so just hopped out and into T2 without concerning myself about time. T1 went pretty well, apart from my bike mount which needs work. Still pretty scared of the "flying" mount and was pretty cautious. No garage sales needed. Once on the bike, I settled in and eased myself into the aerobars. This was only my 5th ride out on Ora and admittedly I am still a little (a lot) scared of her....but there is no time like the present to get used to it! 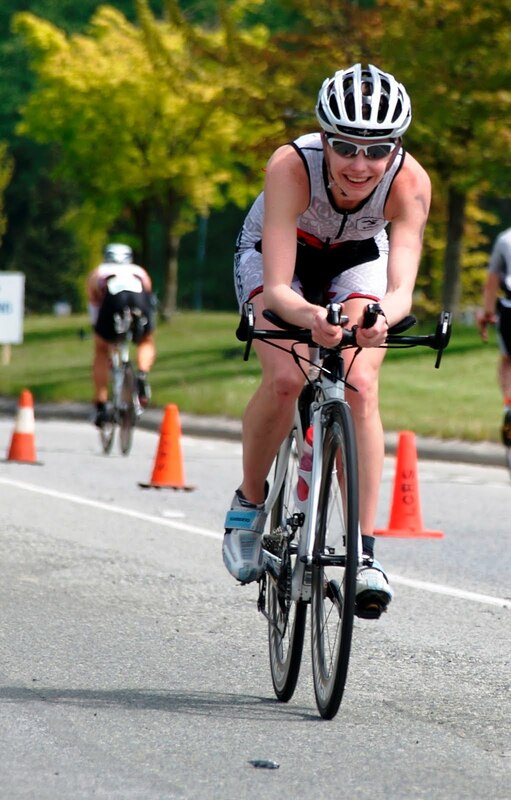 A TT bike is perfect for the UBC course - 4 laps x 10k on SW Marine Drive - straight, mildly sloping and damned fast if you are motivated. I was a little shaken after being sideswiped with a gust of wind on the first turn, but managed to keep my laps relatively consistent. Nice and conservative, not pushing too hard. Ride time was about 1:10, avg speed of 33.4 km. 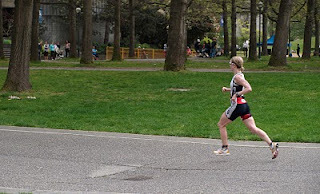 Coming into T2, I spun out my legs and started focusing on the run...which is really my strongest of all three disciplines and where I needed to do well. Drank the rest of my GU Brew, took a gel and thought about what I had to do. T2 was good, apart from my dismount (see above, needs work). The new elastic laces in my Brooks T6 racers were a snap to put on. I tore out of T2 and managed to punch in a first kilometre 4:06. Nice, but not something I thought I would be able to hold. Dialed it down a little, kept my cadence high, slowed to around 4:20/km and just started coasting. It felt great to run. First 3k passed in no time and I was having a lot of fun, seeing people I knew, cheering on the other runners and enjoying the day. It wasn't until I hit 7k that I realized that I was actually holding my pace....which is really funny to me because last week at the Sun Run I was totally suffering at the same pace, here I was today just coasting along and enjoying life. The support on the course was great too - friends, other runners and volunteers were all so encouraging and positive! When my watch beeped at 9k - 39:06, it signaled that it was time to give 'er....except that when 10k arrived, the finish line was nowhere in sight! Ugh! My GPS marked 10.7k when I reached the finish line - I was tired and a little disappointed. Had not planned to sprint for nearly 2k at the end. I also really wanted a 43 minute 10k (which I did have 43:28) and now my watch was showing a 46:35 10.71 km run. At least everyone had to run the same distance! All in all, a very fun race and an encouraging start to the season. Final time was around 2:28, which I was very pleased with considering the extra 3 minutes or so for the run. 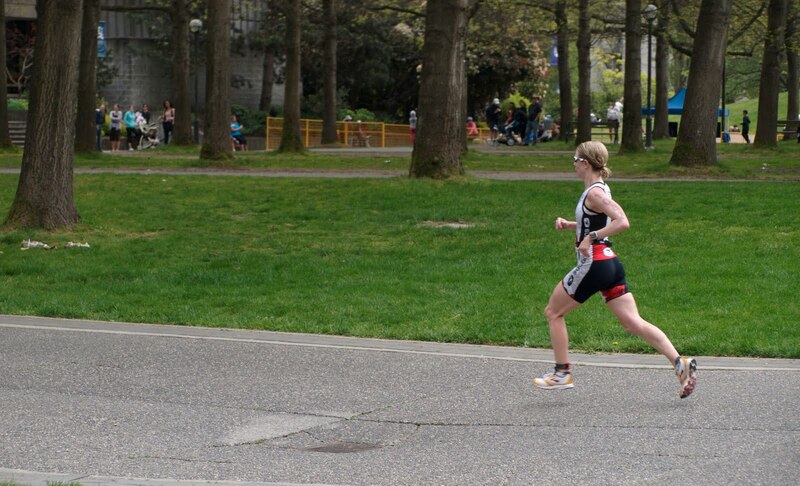 Comparatively, my only other Olympic distance - the Vancouver triathlon last year - was 2:35. Yay! Training pays off! I really appreciate everyone that came to cheer (Hoz, Greg, Tav...you're awesome!). Thanks also to Calvin at Finish Line Coaching as well as the folks at Speed Theory (Doug, Jeremy, Nicole). You all rock!